While the girls were having their ballet and bus adventures (see yesterday’s post), Joshua and I had some adventures of our own. Our was not quite as circuitous as theirs, but we had a great time! The progress as of this week. Somewhere in there is our contribution! When we placed our bricks a week or so ago, we found out about the sorting and behind-the-scenes building night. So got there just in time to get started. After grabbing a coffee or tea (the English are always hospitable), everyone was invited to break into groups to add 7,500 bricks that night or sort another 7,500 bricks. Joshua’s eyes were as big as saucers: 15,000 Legos in one night! WAHOO! We were only able to help place about 3,000 (ONLY 3,000) that night before the girls got there and we had to start walking home–it was getting late. We met some very nice folks, and I look forward to working with them some more in the future. But that’s not what I wanted to talk about. I told that story to make another point. 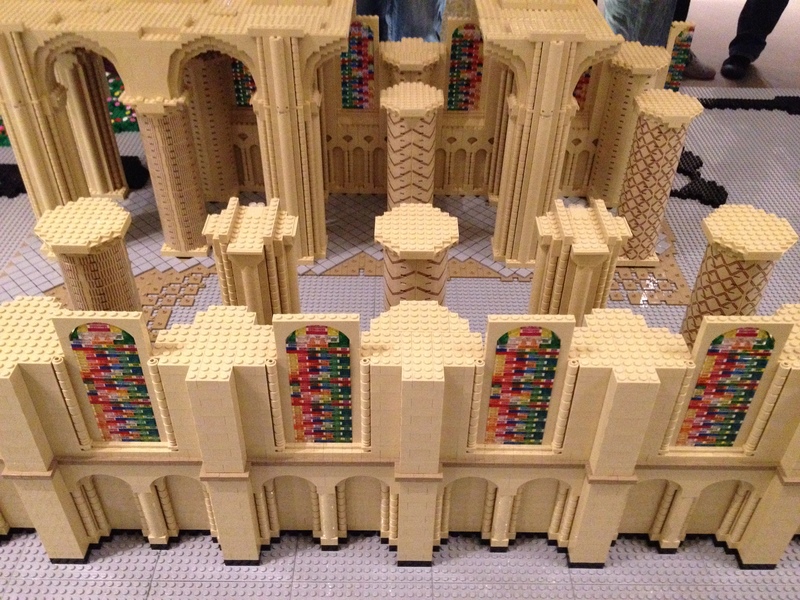 Some may be saying, “What’s a church got to do with Legos? Why aren’t they aren’t doing other work? Churchy-kinda work?” Those may be some good points. But let’s consider something for a moment. This week I met a doctoral researcher who is studying Cathedrals as an outreach tool. Worship participation in Britain is less than 10%. Yet millions of people will visit the Cathedrals this year. Professed atheists may come to a Cathedral for the architecture or the music or something interest. When Joshua and I walked up to the Palace Green to take part in the Lego build, we saw a woman wearing the hijab (Muslim head scarf) having her picture made in front of the Cathedral. Now, would any of these people darken the door of a church? Probably not. However, they may come into a Cathedral for a “secular” tour and see a picture, a sacred object, a stained-glass window, or some other object and be led by God’s Spirit to a deeper conversation of Faith. These are the kind of things (among many others) God can use to bring people unto Himself. I am excited that my new friend is researching such an idea. The aging Cathedrals don’t have to be an albatross around the neck that sinks the church. Instead, they still may be tools to bringing about the Kingdom of God in the World. If you spend much time with me you’ll know that I like finding middle ground (places and ideas) to discuss faith. I am an advocate for using our church buildings for things that would bring the public into the doors: scout meetings, business lunches, continuing education classes, polling stations, whatever it may be. That doesn’t excuse us from going OUT of the doors to share the Hope of Jesus Christ with others. But we shouldn’t lock the church doors until 10:30 on Sunday mornings. I am curious as to ways you might have seen the church buildings used for more than just an hour on Sunday mornings–and what effect it had on others. In the past my church used its basement to provide a safe haven during one of our larger hurricanes. It wasn’t announced because it wasn’t originally in the plans. It just occurred to neighbors around the church, as the storm got bigger and bigger, that the church was the strongest place of refuge. I think I see another sermon!! I am going to save that one! I can see a sermon coming out of that one! I agree that opening the church to “outsiders” is very valuable. And this can be pretty easy for some groups and church members. But, when the visitors look different, believe differently, and maybe even smell different, this can be a big challenge for some members of a congregation. Mathew 25: 31-46 can be a challenge ….